On the 3rd (Wed), take a stroll through Twin Peaks and then tour the pleasant surroundings at Fort Funston National Park. Here are some ideas for day two: snap pictures at Golden Gate Bridge, then head off the coast to Alcatraz Island, and then take a leisurely stroll along Fisherman's Wharf. Inspirock's itinerary builder makes planning a San Francisco trip simple and quick. Salt Lake City to San Francisco is an approximately 4-hour flight. You can also do a combination of flight and subway; or drive. Traveling from Salt Lake City to San Francisco, you'll gain 1 hour due to the time zone difference. While traveling from Salt Lake City, expect much colder days and little chillier nights in San Francisco, ranging from highs of 73°F to lows of 57°F. Wrap up your sightseeing on the 4th (Thu) to allow time to travel to Los Angeles. On the 5th (Fri), catch a live performance at Walt Disney Concert Hall, kick back and relax at Will Rogers State Beach, and then enjoy the sand and surf at Venice Beach and Boardwalk. To see other places to visit, photos, and more tourist information, read our Los Angeles travel route builder . Traveling by combination of flight and train from San Francisco to Los Angeles takes 4.5 hours. Alternatively, you can do a combination of subway, flight, and train; or drive. Prepare for somewhat warmer weather when traveling from San Francisco in July: high temperatures in Los Angeles hover around 83°F and lows are around 66°F. 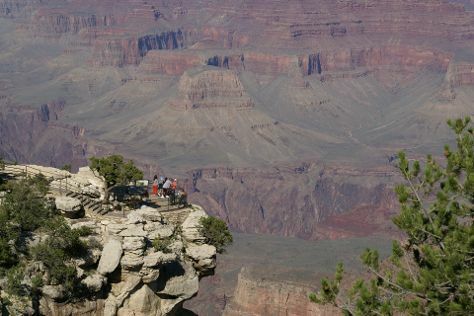 Finish your sightseeing early on the 5th (Fri) to allow enough time to drive to Grand Canyon National Park. Start off your visit on the 6th (Sat): add some entertainment to your itinerary with Hopi House and then hike along Rim Trail. Keep things going the next day: take in breathtaking views at Grand Canyon South Rim, take some stellar pictures from Powell Point, then explore the stunning scenery at Yavapai Point, and finally hike along South Kaibab Trail. To see maps, ratings, photos, and tourist information, read our Grand Canyon National Park trip itinerary tool . You can drive from Los Angeles to Grand Canyon National Park in 7.5 hours. Alternatively, you can do a combination of flight and bus; or do a combination of flight and shuttle. You'll lose 1 hour traveling from Los Angeles to Grand Canyon National Park due to the time zone difference. Traveling from Los Angeles in July, Grand Canyon National Park is slightly colder at night with lows of 52°F. Wrap up your sightseeing on the 7th (Sun) early enough to travel to Las Vegas. Start off your visit on the 8th (Mon): try to win big at Paris Las Vegas, then try to win big at Bellagio Hotel and Casino, then shop like a local with The Strip, and finally enjoy some music at Bellagio Fountains. To see maps and tourist information, read Las Vegas online trip itinerary planner . You can do a combination of flight and car from Grand Canyon National Park to Las Vegas in 4.5 hours. Alternatively, you can drive; or take a shuttle. The time zone difference moving from Mountain Standard Time (MST) to Pacific Standard Time (PST) is minus 1 hour. When traveling from Grand Canyon National Park in July, plan for somewhat warmer days and much hotter nights in Las Vegas: temperatures range from 104°F by day to 81°F at night. Wrap up your sightseeing on the 8th (Mon) early enough to drive to Zion National Park. On the 9th (Tue), explore the wealth of natural beauty at Zion National Park. For where to stay, other places to visit, and other tourist information, refer to the Zion National Park trip itinerary planner . You can drive from Las Vegas to Zion National Park in 3 hours. Other options are to do a combination of flight and taxi; or do a combination of flight and car. Due to the time zone difference, you'll lose 1 hour traveling from Las Vegas to Zion National Park. When traveling from Las Vegas in July, plan for a bit cooler days and much colder nights in Zion National Park: temperatures range from 94°F by day to 59°F at night. Finish up your sightseeing early on the 9th (Tue) so you can travel to Colorado Springs. On the 10th (Wed), admire nature's wide array of creatures at Cheyenne Mountain Zoo, then explore the striking landscape at Garden of the Gods, and then get to know the fascinating history of Old Colorado City Historic District. To see photos, other places to visit, where to stay, and other tourist information, read Colorado Springs trip itinerary builder site . Traveling by combination of taxi and flight from Zion National Park to Colorado Springs takes 5 hours. Alternatively, you can do a combination of taxi, flight, and shuttle; or drive. Traveling from Zion National Park in July, expect nights in Colorado Springs to be about the same, around 58°F, while days are a bit cooler, around 86°F. Cap off your sightseeing on the 10th (Wed) early enough to travel to Santa Fe. Start off your visit on the 11th (Thu): soothe aching muscles at Absolute Nirvana Spa & Gardens and then take a stroll through Canyon Road. For photos, where to stay, ratings, and more tourist information, use the Santa Fe trip itinerary planning tool . Traveling by flight from Colorado Springs to Santa Fe takes 4 hours. Alternatively, you can do a combination of shuttle and flight; or drive. In July in Santa Fe, expect temperatures between 88°F during the day and 60°F at night. Finish your sightseeing early on the 11th (Thu) to allow enough time to travel to Albuquerque. Kick off your visit on the 12th (Fri): get a new perspective on nature at Indian Pueblo Cultural Center and then soar above the sights with a balloon tour. To find where to stay, maps, other places to visit, and more tourist information, refer to the Albuquerque day trip tool . Traveling by bus from Santa Fe to Albuquerque takes an hour. Alternatively, you can drive; or take a train. Traveling from Santa Fe in July, you can expect nighttime temperatures to be a bit warmer in Albuquerque, with lows of 67°F. Finish up your sightseeing early on the 12th (Fri) so you can travel back home.